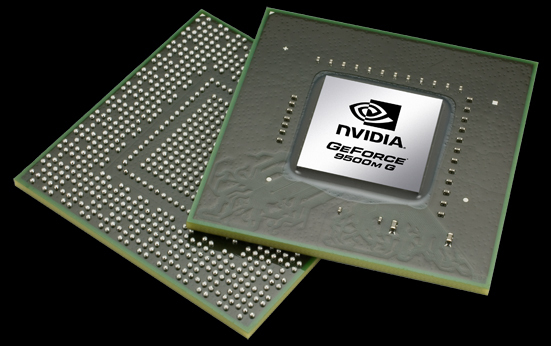 The Nvidia GeForce 9500M G is the successor of the 8600M GS as it also featuresonly 16 unified shaders (the 9600M series features 32). Compared to the8600M GS, the 9500M G has an improved PureVideo HD engine (VP3), supports Hybrid-SLI and needs less current (because of the 65nm process). In conjunction with the Nvidia 9100M G integrated graphics, the 9500M G supports Hybrid-SLI (HybridPower and GeForceBoost). HybridPower is a technique to choose between the integrated and dedicated graphics core, if performance or battery runtime is needed. This works only in Windows Vista. Up to now the user has to use a tool to switch between the GPUs. Later Nvidia wants to switch automatically in the drivers. GeForceBoost uses the integrated graphics core of the 9100M G and the dedicated of the 9500M G in SLI mode to achieve better frame rates. As the 8600M GS, the 9500M G features 16 stream processors that do the work of the former dedicated pixel- and vertex-shaders. The unified shaders of Nvidia are 1-dimensional (AMD has 5-dimensional shaders which leads to the higher number of shaders). The desktop GeForce 9500 graphics card is not compareable to the mobile 9500M G, because it has 32 stream processors (compareable to the 9600M series). Die NVIDIA GeForce 9500M GE (sometimes also called only 9500M or 9500M GM) is a combination of the Nvidia GeForce 9400M (G) chipset and a dedicated NB9M entry level graphics card (GeForce 9200M GS or 9300M GS) in GeForceBoost mode. HybridPower is a technique to choose between the integrated and dedicated graphics core, if performance or battery runtime is needed. This works only in Windows Vista. Up to now the user has to use a tool to switch between the GPUs. Later Nvidia wants to switch automatically in the drivers. GeForceBoost uses the integrated graphics core of the 9400M G and the dedicated of the NB9M (9300M GS or 9200M GS) in SLI mode to achieve better frame rates. The performance of the 9500M GE graphic solution depends on the SLI support of the game and the type of dediacted NB9M graphics card (clock rates and memory). Dell for example claims to reach 3300 points in 3DMark06 with a 9300M GS with 256MB GDDR3 RAM (in GeForceBoost mode). This would be as fast as slow GeForce 8600M GT cards. Still the performance in actual games may be much slower. Furthermore, the 9500M may suffer from micro stuttering (stuttering in playable regions of 30 fps) in GeforceBoost because of different frame times. The gaming performance of the solution should be sufficient for DirectX 9 games in medium detail settings. Demanding DirectX 10 games, like Crysis will only run in low detail settings. The power consumption of the 9500M GE depends on the Hybid SLI setting and can reach up to 25 Watt TDP for the combination (including the chipset).